Everything! Simple put , lovely, wonderful, hassle free. breakfast was awesome cold, hot and fresh fruit ! Coffe was good. Staff were wonderful, resourceful and speak just about every language. 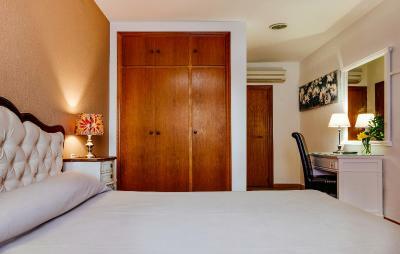 Room was clean , quiet comfortable and it was divine to be able to control room temperature yourself. Bar downstairs offered any hot water needed for tea. definitely will come back! This is such a great place to stay - we’ve been before, and didn’t hesitate to book again for this trip. 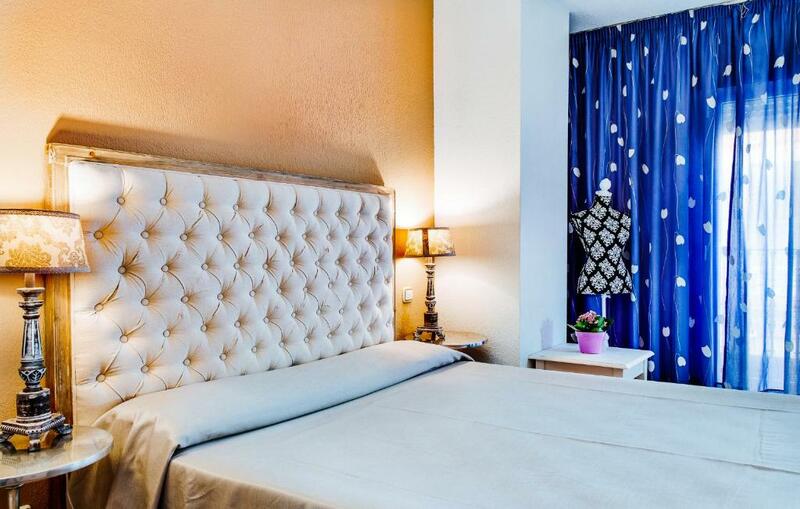 Such a lovely hotel for the low cost you pay. The rooms are lovely and everywhere is spotlessly clean. 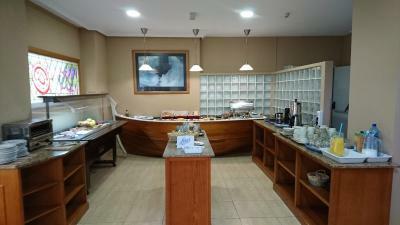 The breakfast buffet options are sizeable - who doesn’t love cake and chocolate biscuits at breakfast?!! Finally, the hotel staff are all very friendly and helpful. I left my Apple AirPods behind and didn’t realise until 2 days later. A quick panicky email to them lead to a reassuring reply that they’d found them and were keeping them safe. The staff was incredibly nice and helpful and manu of them were fluent in english as well. The breakfast was good and the coffee was excellent:) Also to add the staff was very quick to clean the rooms and the hotel was very quiet as well. The staff are very helpful and welcoming this is our second stay .. location ok ...nice pool and parking. Good breakfast and bar area good. It was a basic hotel and the rooms were basic but for the price that is what I expected. Breakfast was good for an average hotel. There was a little bit of hot food, plenty of sweet cakes and pastries, small amount of cereal, plenty of toast, juice and fruit limited. Hotel room ok but small and no view. We had a reasonable meal nearby, walking distance to shops, restaurants and beach. 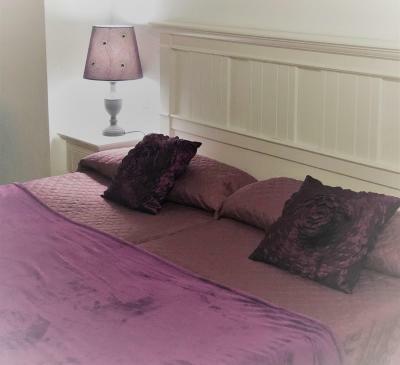 All we required was there, lovely breakfast, clean and comfortable and helpful & friendly staff ! Very friendly and nice staff, good breakfast, very good location. The room on the 5th floor was very quiet, spacious and nice, big comfortable bed, excellent shower and a nice balcony, very clean. We liked it a lot with my husband and would return. 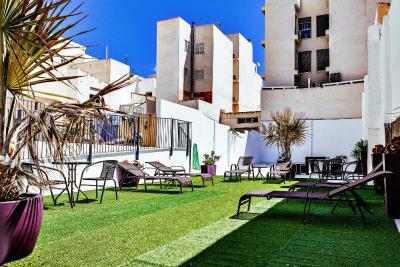 Hotel Madrid This rating is a reflection of how the property compares to the industry standard when it comes to price, facilities and services available. It's based on a self-evaluation by the property. Use this rating to help choose your stay! 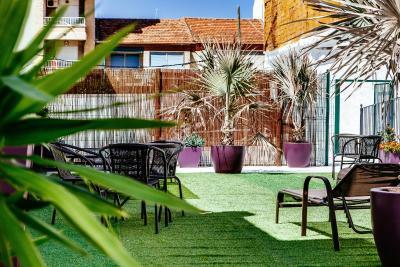 One of our top picks in Torrevieja.Hotel Madrid is in central Torrevieja, a short walk from the beach. 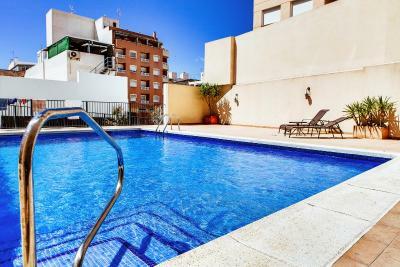 It has an outdoor pool just 2 minutes 'walk away. 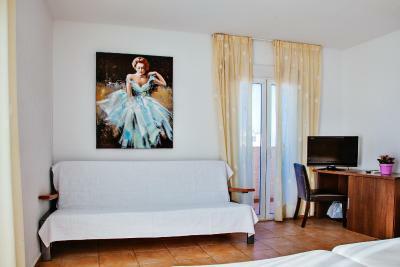 All rooms offer free Wi-Fi and a flat-screen TV. 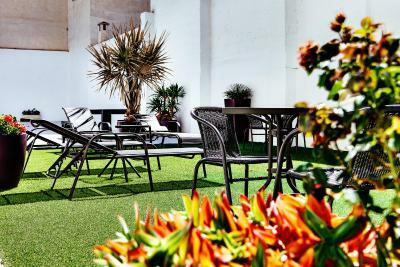 Hotel Madrid has a large sun terrace. Bicycle and car rental are both possible on site. 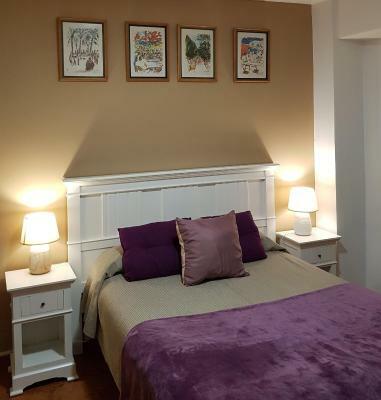 The hotel is a short walk from the Town Hall. 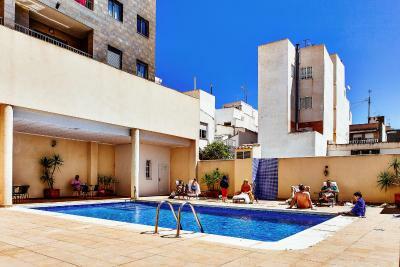 Torrevieja is also famous for its churches, the Casino and the Jardín de las Naciones gardens. Boat trips are available to the island of Tabarca. The Terra Mítica Theme Park is 62 miles away in Benidorm. 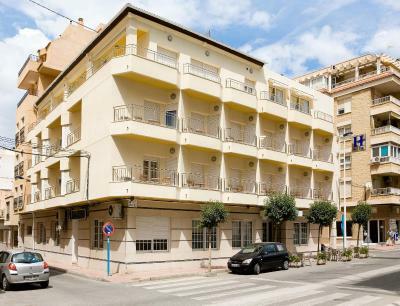 Alicante is also nearby. Rooms at the hotel are fully air conditioned and have a safety deposit box and a mini-bar. The private bathroom includes a hairdryer. 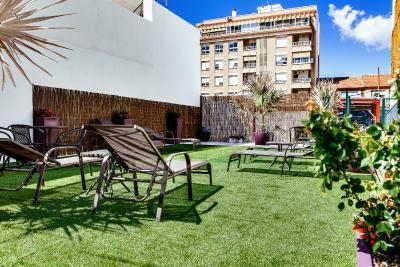 When would you like to stay at Hotel Madrid? 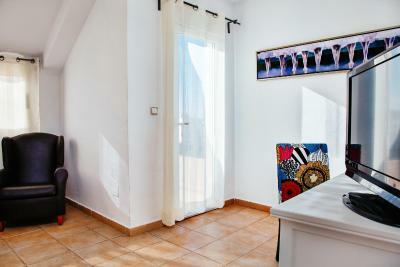 This air-conditioned room offers a balcony or terrace, a mini-bar, free Wi-Fi and flat-screen cable TV. The private bathroom comes with a hairdryer. 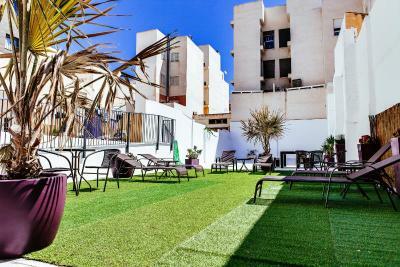 House Rules Hotel Madrid takes special requests – add in the next step! Hotel Madrid accepts these cards and reserves the right to temporarily hold an amount prior to arrival. Please inform Hotel Madrid of your expected arrival time in advance. You can use the Special Requests box when booking, or contact the property directly using the contact details in your confirmation. Location was good in between marina and beech. Thought according o your website that there was some sort of shuttle service to and from the airport but this was not the case taxi cost us €55 euros each way. Seemed to be a bit work going on hammering from 8am in the morning we were not made aware of this. 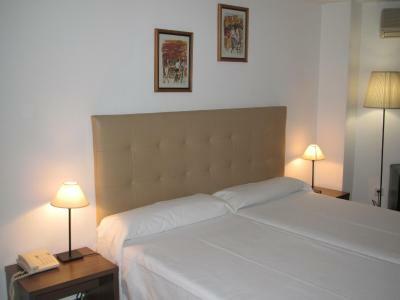 Hotel spotlessly clean friendly staff, free WiFi, Free Safe, breakfast excellent, bonus having small fridge in our room. NO TEA/COFFEE MAKING FACILITY IN ROOM. If I was being very critical, I would say the shower wasn’t great as when the tap was on full it sprayed out across the end of the bath! With a bit of caution and a not so powerful shower this was resolved. The hotel were great for our needs. Everything was clean and neat. Nice decor, simple but modern.